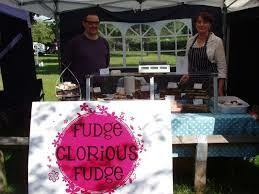 Fudge Glorious Fudge is back in Nottingham! Queen of fudge Alison is back on her throne this weekend at the Taste of the Greats Notts show, with her regal sweets treats ready to go, the Corgis won’t be the only ones left drooling. Not only is her fudge ever so mouth wateringly tasty but the royal highness of sweet things is also an avid supporter of Nottingham’s local community, what’s not to love about this gem! Still sourcing all the butter and cream for her delicious fudge locally Alison has gone the extra mile by making coloured fudge for Notts County Football Club (Black and White) and Carlton Town (Yellow and Blue), what better way to get behind Nottingham’s football team and supporting events like the Great Notts Show promoting the local food industry. Alison let us in on the secret behind why her fudge is so delicious and the answer is simple…practice, practice, PASSION! You will struggle to meet anyone as dedicated to finding only the best ingredients for her fudge and what makes the product even more special is its naturally gluten free. Finally a sweet treat suitable for vegetarians too, she really has got fudge for everyone! 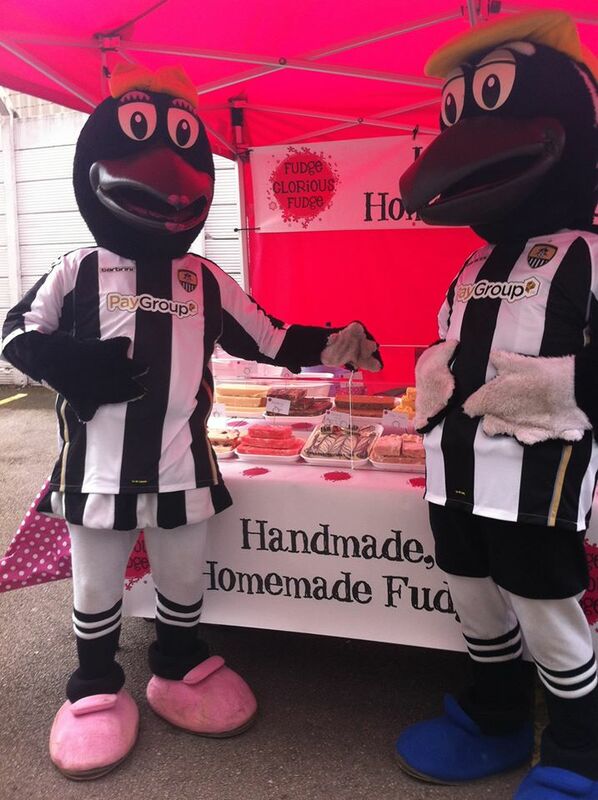 Notts County FC mascot trying out their personalised fudge! Alison gives a sneaky peak into what’s in store for the weekend, and we are in for a treat! With the summer now officially over, Alison is lifting spirits by introducing some simply irresistible flavours for the Taste of Nottingham show, these include: Cherry Bakewell, Salted Caramel and Rose along with traditional flavours: Vanilla, Rum and Raisin, Baileys and Chocolate Orange! As well as coming to sell her delicious products, Alison can’t wait to come back on Friday having had such a great time at the last event, with a great range of other stores there is something for everyone and she is looking forward to seeing old and new friends. Lastly don’t be worried about not finding Fudge Glorious Fudge they are hard to miss in the Big Pink Tent, so we will see you in the line! Perfectionist by nature Alison is always keen to hear feedback about her fudge so if there any new exciting flavours that you would like to see or feedback for Fudge Glorious Fudge leave your comments below. Or better still get in contact with Alison over her new Facebook page where you can find out more about Alison and her company! Previous Johnny Part 3 and a final round up! Next Reviewing the Taste of the Great Notts Show, One plate at a time.